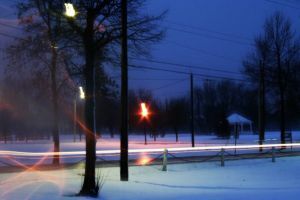 The highway was bare, not a car was in sight and bright moonlight on fields of surrounding snow on this January night made for easy visibility—I hardly even needed headlights.I had been away for the better part of a week and was eager to get home. So I pressed on the accelerator and sped up to seventy miles an hour. It was just past ten o’clock and there were few other travelers on the road. When I left the airport in Regina, Saskatchewan, the temperature was close to thirty degrees below zero, but with no wind and a perfectly clear night, I had the highway to myself. I turned off the Trans-Canada highway, route number one, and was headed north and east on Saskatchewan route ten toward Manitoba and my home in the town of Dauphin. I would get home somewhere around two AM. I turned on my radio and settled in for a long uneventful ride home.